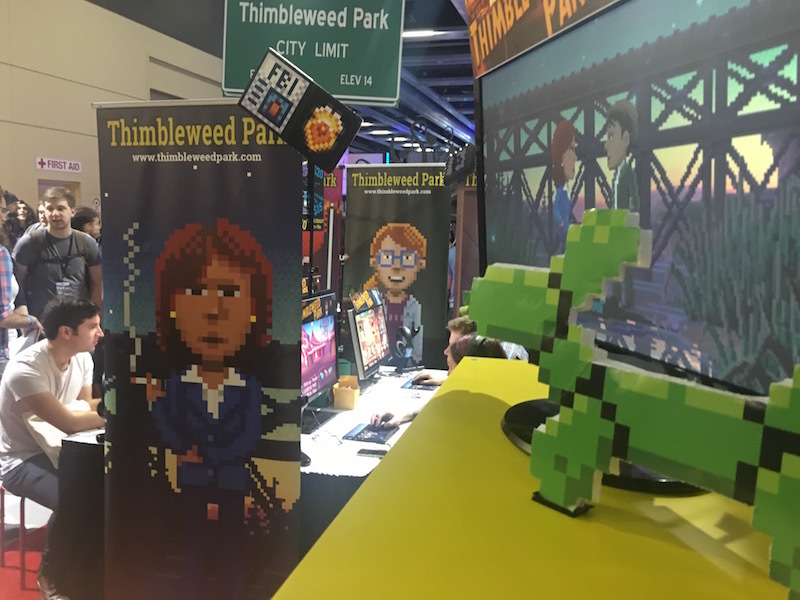 More exciting pictures from Thimbleweed Park at PAX West. 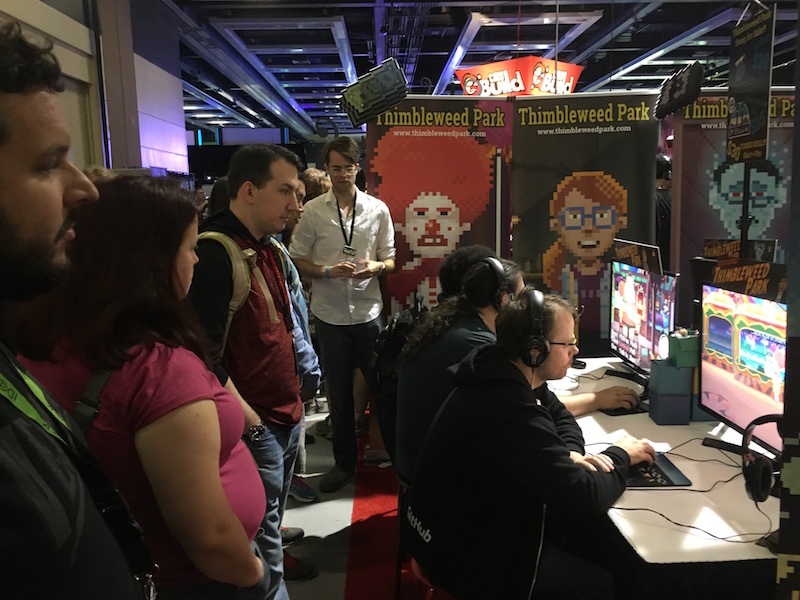 PAX West was four days and the forth day was grueling, but the excitement and energy around the booth kept us going. 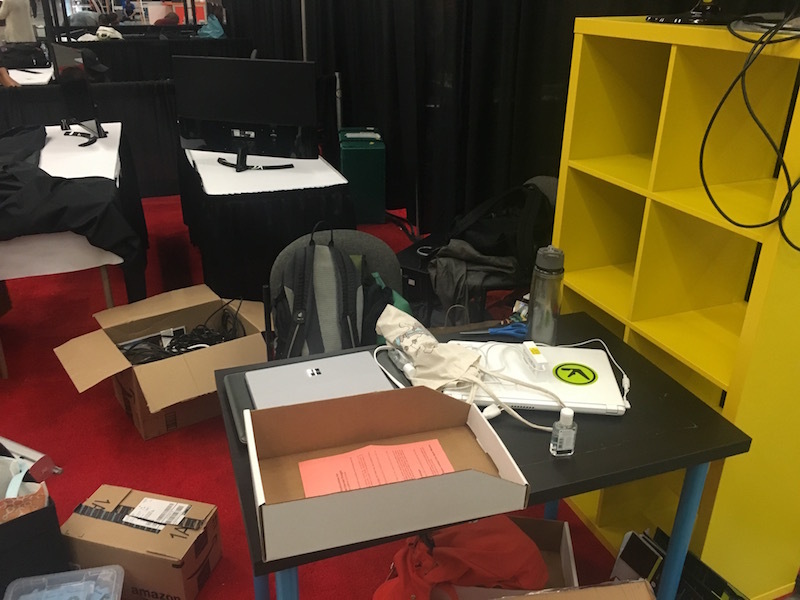 Like PAX East, we had four stations that remained full right up to closing time when we had to kick people off. 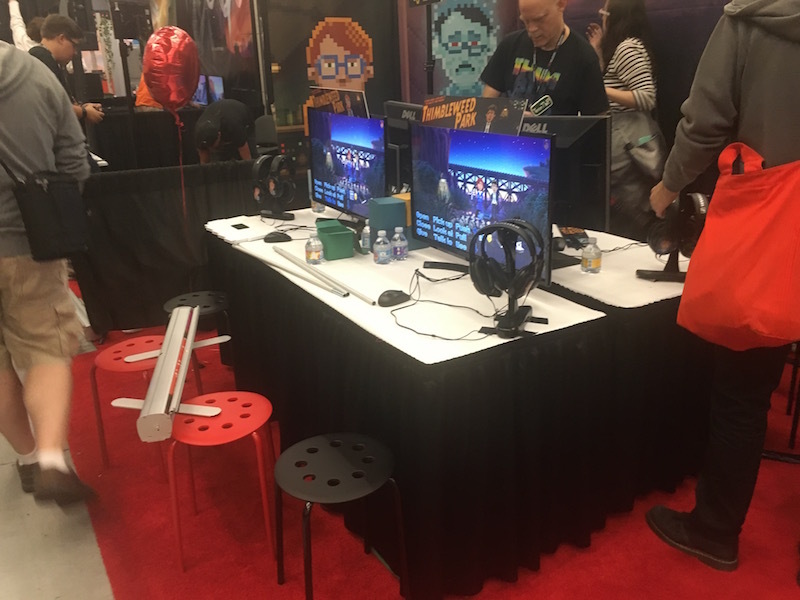 At PAX East we had a long line of people waiting to play, but for west we created a signup list, so people could get their name on it and then go off for a bit and come back. Hard to tell for sure, but it seem to work a lot better. It was great to meet so many backers and blog readers. 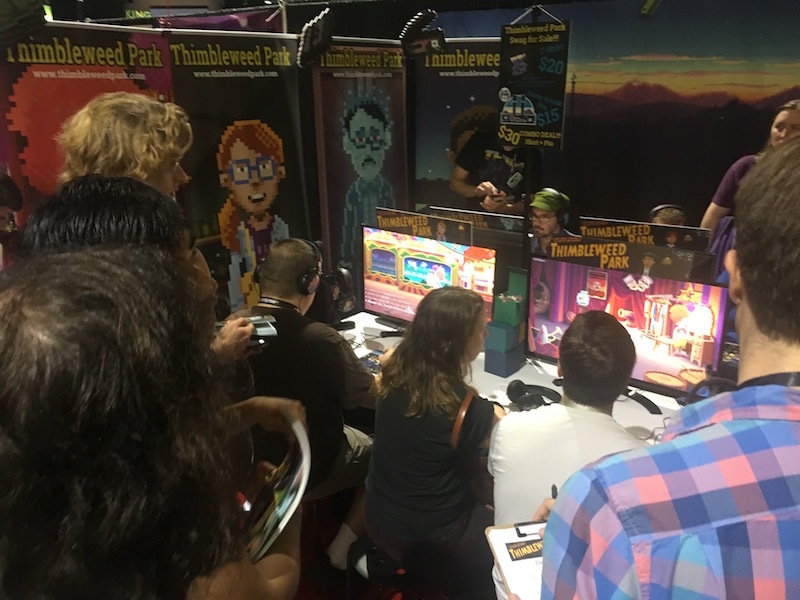 We also had a lot of people come up that had never heard of the game before, but they were big Monkey Island and Maniac Mansion fans. 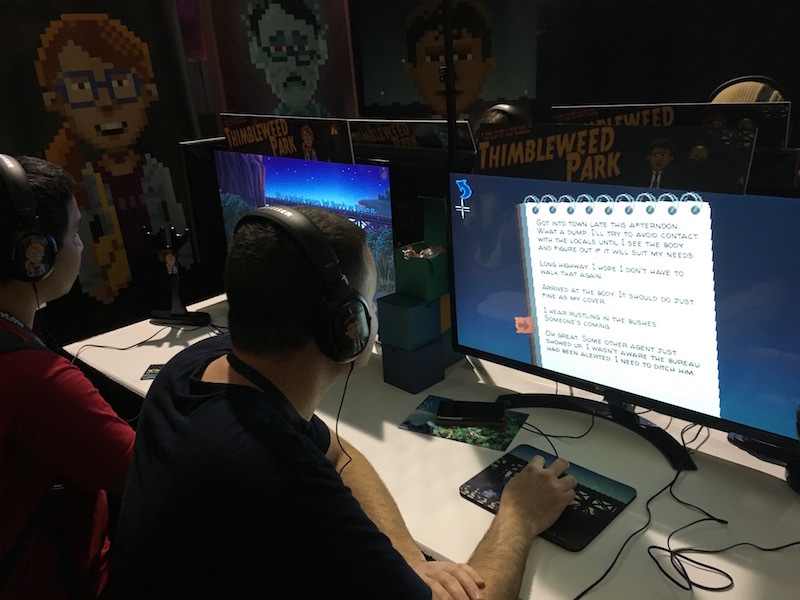 We also had people that had never really played adventure games before, so it was nice to see their reaction. Much disappointment that the game wasn't out yet. 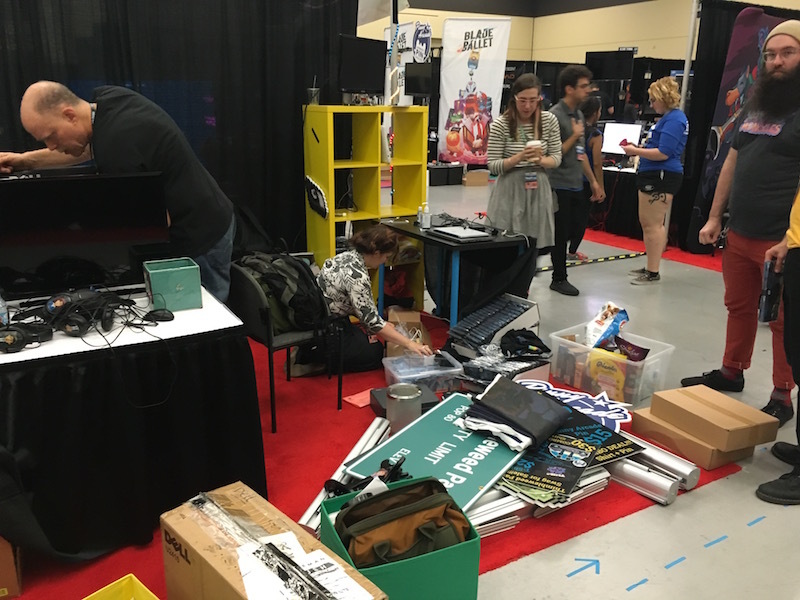 But all good things must come to an end, and it was time to dismantle the booth. 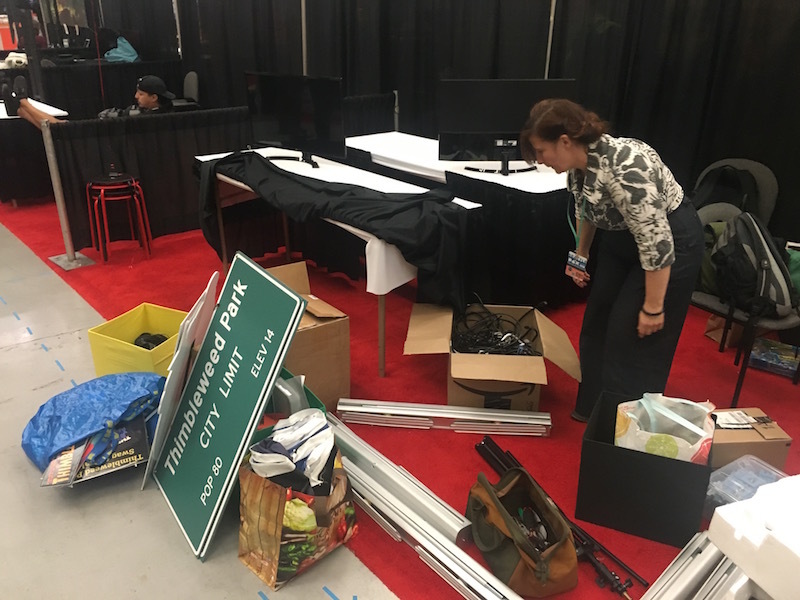 It took up a whole day to set up and a little more than an hour to tear down. 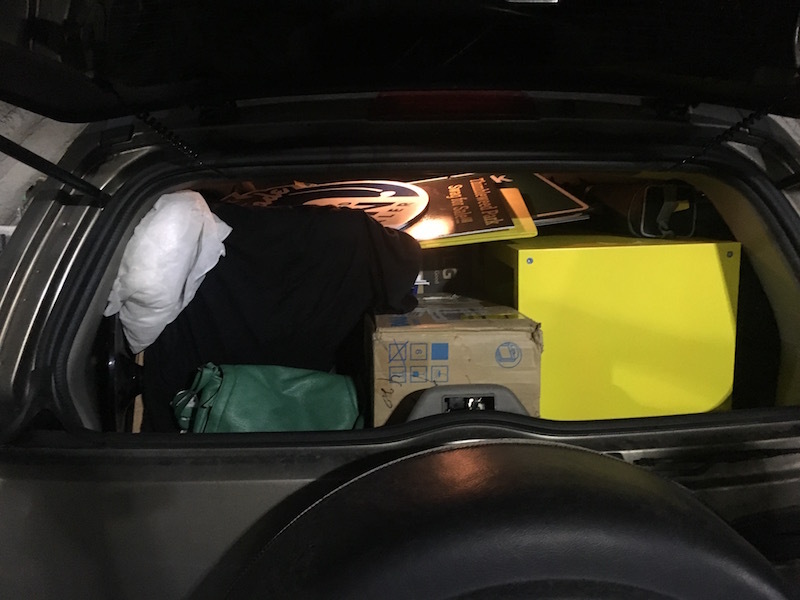 Everything packed into my Jeep ready for storage until next time. Thanks to David and Chase for watching the booth and helping get people signed up and playing. Thanks to our friends Sophie and Owen who took some shifts and helped out. Elise, who does the voice for Delores, even stopped by to help out for a few hours. 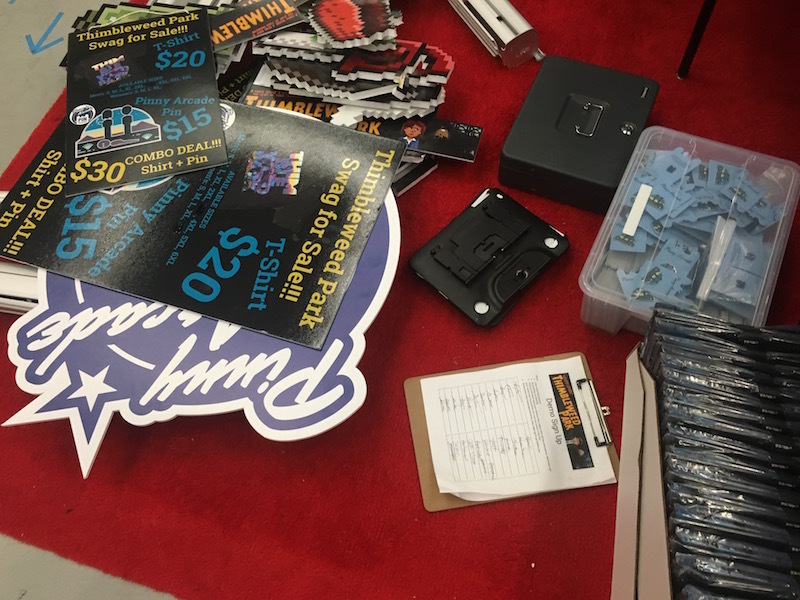 And huge thanks to ThimbleTeam member Jenn who designed and organized the booth and all our merch. 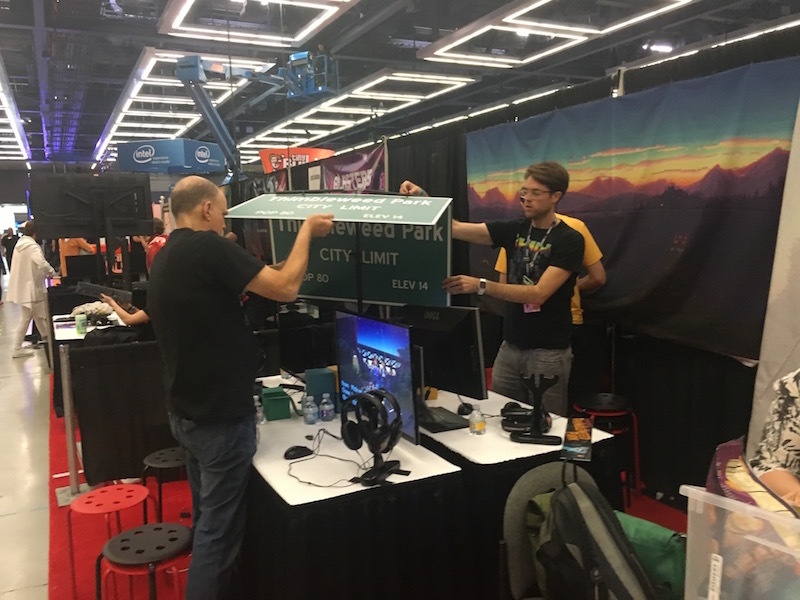 And most of all, thanks to everyone that stopped by to say hi and play the game. We're trying to figure out how to do something like this in Europe. The logistic are a lot harder and it's quite a bit more expensive, but we're thinking... we've got our smart-glasses on. ...except there's no such thing a games convention in Berlin, so, uuuh... yeah, come to Europe! There is a fun story about that Ikea chair you are using. Take care no one sits naked. mmm... I was really hoping to play TP while showering comfortably sitting in my IKEA chair. Ron, can I please get a refund? Hey Ron, if I finish work on time can I go? Can I? I want a CREEPER DOG like the one in the first picture!!! Seriously, where can I get one? And let's hope you all get away without the obligatory convention sickness. How about http://firstlookfestival.nl/ in the Netherlands? 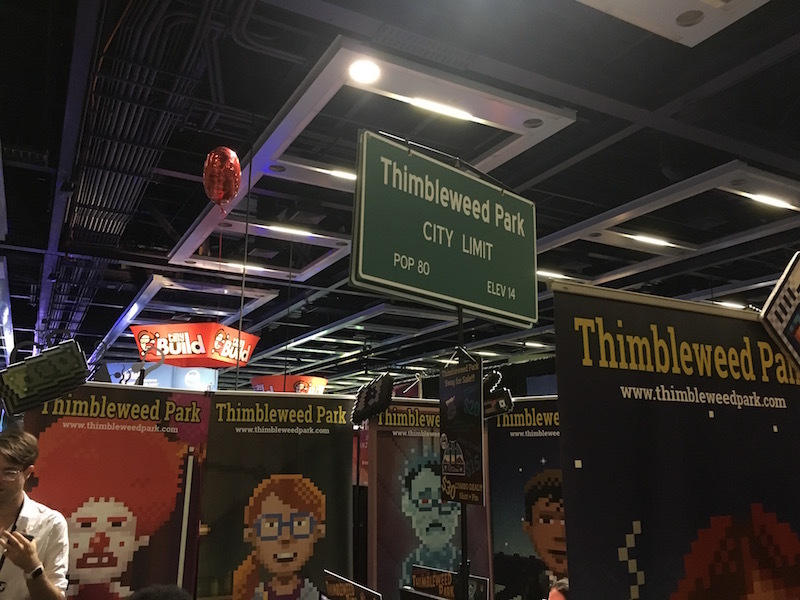 Just as food for thought: if you want to demo Thimbleweed Park in Europe, the West of Germany would be a very good location. Short drive from Netherlands, Belgium, short flights from UK or Scandinavia, eastern/southern Germany is about 3hrs away by train as well as is France. Germany already had its magic moment in Cologne. San Marino or Vatican City. Why would it be "unfair" to propose one's home country? Seriously, it is located in the heart of Europe with excellent transport connections and a substantial share of Europeans live there. It' s up to Ron and the team. 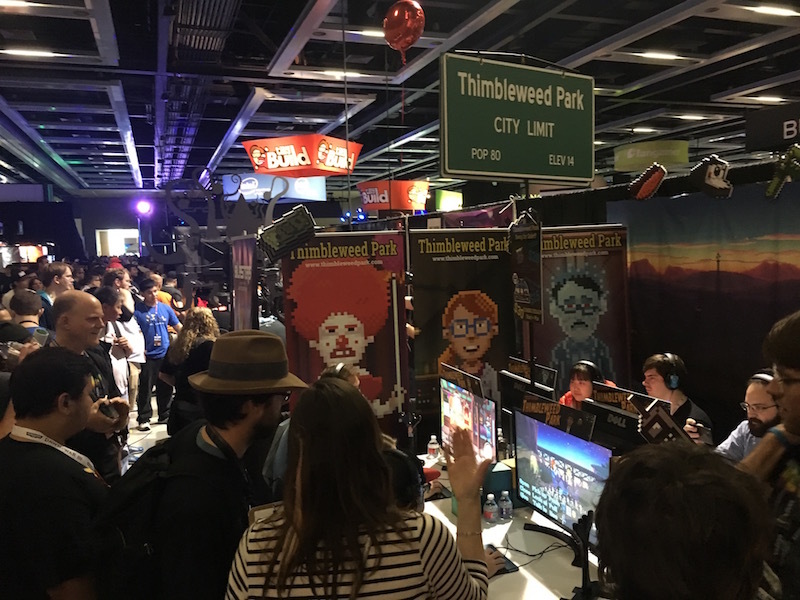 I do not know whether they are looking for a location where they've not yet presented Thimbleweed Park or which allows them to reach the largest audience. It would be nice to meet you! :-) I won't be dressed as anything special. If TWP comes to Sweden, I'll be there! 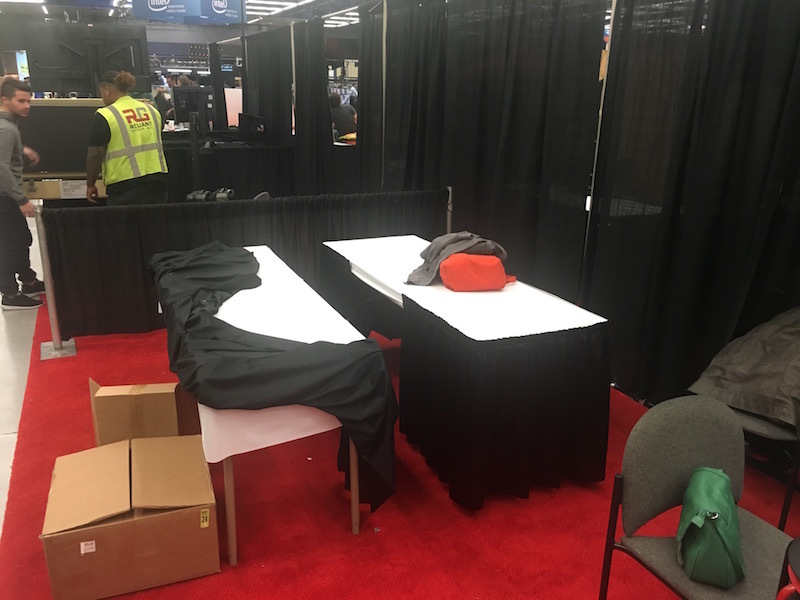 Your booth was great. Enjoyed visiting you guys and loved playing the game for the first time. Thanks for being so friendly! We'd love to see you guys here in EU. Sunny Spain is waiting for you! What did all the players and testers say about the new UI? Have you skipped some ideas, have you got new ideas? What was most interesting, most funny reaction of all the players?? No one I talked to said anything about the new UI, not specifically. Just general comments about how great it looked. One person said everything I've been talking about on the blog makes sense now that he's seen it close up. I'm guessing it's David, he seems the most likely to be into avant-garde UK electronica. Aphex Twin sticker there - second that! It still amazes me that there are people from one of the focus groups (LFL nuts, MI players, 30something) who have not yet heard of the game. If Europe is a struggle then I'm guessing PAX Australia is definitely out?? Seriously, where can I get a CREEPER DOG? By the way, you're always welcome here in Iceland. We may not have any regular gaming conventions, but still... Feel free to visit! 1) That would take some time to write. 2) There is no/really-flaky internet/cell-reception in the convention hall. Too many phones! I would go hours and never get a connection. From a marketing perspective this would not be a good idea: Long waiting lines are very good for photos and for the overall impression of high demand. Alle the bloggers and journalists should leave with the feeling, that it was very crowded. If you organize it perfectly and get rid of most people waiting, than the photos would suggest that there is only a very mediocre interest. So: Waiting lines are good. In my opinion, you can see so many curious people on the photos that this interested crowd is even more advantageous than a long queue full of thirsty, hungry and tired grumblers. It seems that there wasn't even enough space for a queue, unless you are looking for a fateful confrontation with the host. Of course, it would be more complicated if you did something like this in Europe. Well, you could ship every item you can't carry with your personal luggage via airfreight to Robert or Malcolm, who may store it for the period until the convention. Since there are lots of IKEA stores, too, even the pieces of furniture might not be a big issue. 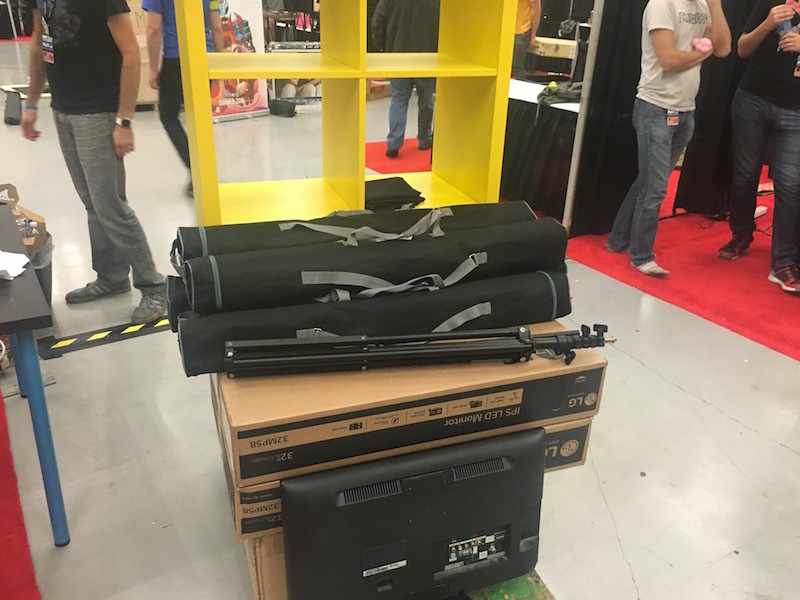 And, maybe some backers would adopt them when you pull down your booth. Unfortunately, I personally would not be able to visit your booth in Europe. But, I'm okay with just waiting for the release of the game. Well, at least it's unlikely that I would get the opportunity for some reasons. So you think shipping a chainsaw and a can of gas via airfreight is a good idea? True, for such case it is really great that you can just buy the same furniture from IKEA but on the other side of the planet. Don't worry about expenses. I'm sure you can sleep on Europe's couch. While he rendered a positive overall assessment, the author surprisingly wrote that the controls could have been a bit more streamlined. Well, I honestly don't know at all what he means by this. I couldn't imagine a better UI. Perhaps he would have preferred a game controller. I did not understand me neither... 'a bit more streamlined'... in the sense of 'aerodynamic' ? Maybe a webcam watching the eye-movements could be such an improvement? Yes. Maybe he is simply a VR fan. We usually didn't explain the finer details of the UI, like hitting the right mouse button to use the default verb... And since there was no keyboard available, they couldn't rapidly move through the dialog/text. Thank you for your reply, David! This may be the reason indeed. Thanks for this link! As far as his 'could have been more streamlined' command, I suppose someone could just ask him what he meant. 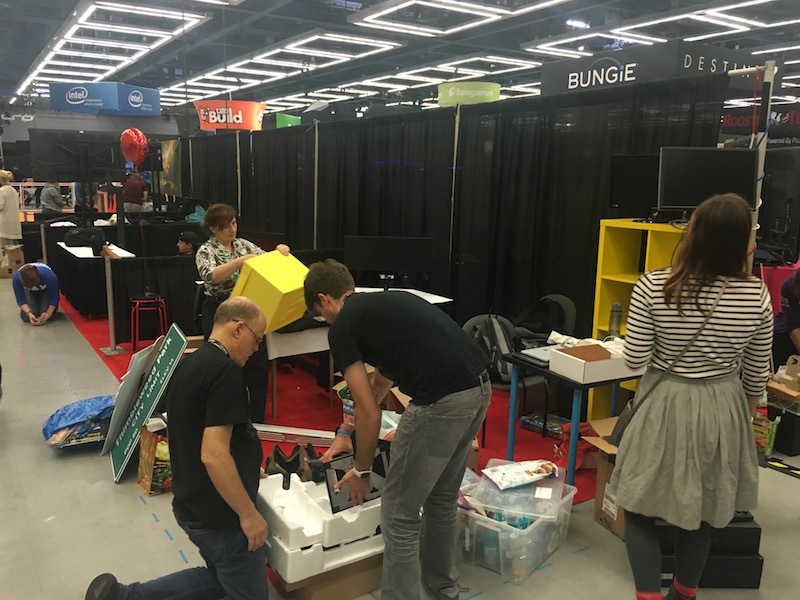 Ron: Use Jen on mission, "Setup PAX booth"
I want a CREEPER DOG like the one in the first picture!!! Where can I get one? I was going to suggest EGX Rezzed in London, but TP is due to be released before then. If that changes, let me know - we have a comfy shed. I would love to see this booth somewhere here in Italy but I suppose it's far from happening... maybe Milan or Rome. I wouldn't miss such a fun opportunity, to play the game and meet you guys! Great to hear about all the positive reactions you guys are getting, just gets me more gee'd up in anticipation of the release! I wonder how adventure game newbies percieved the game the first time they played. I mean not your averige call of duty guy but one who appreciates a bit more thoughtful game. It would be cool if the effect was often the same kind of amazement as when I got my first doses of Lucasfilm/Sierra games.